All of the Bible scriptures used on this website are from the King James Version Bible. It has been created and produced by Phil Michel. The Bible and The Book of Mormon are historical testaments of Jesus Christ. Jesus is the Christ manifesting himself unto all nations. The Bible record deals mainly with events that took place in the Eastern Hemisphere from about 4000 B.C. to 96 A.D. The Book of Mormon record deals mainly with events that took place in the Western Hemisphere from about 2500 B.C. to 421 A.D.
2 Nephi 29:1-14 Date 559-545 B.C. The resurrected Savior visited and taught the ancient people who lived in the Americas. 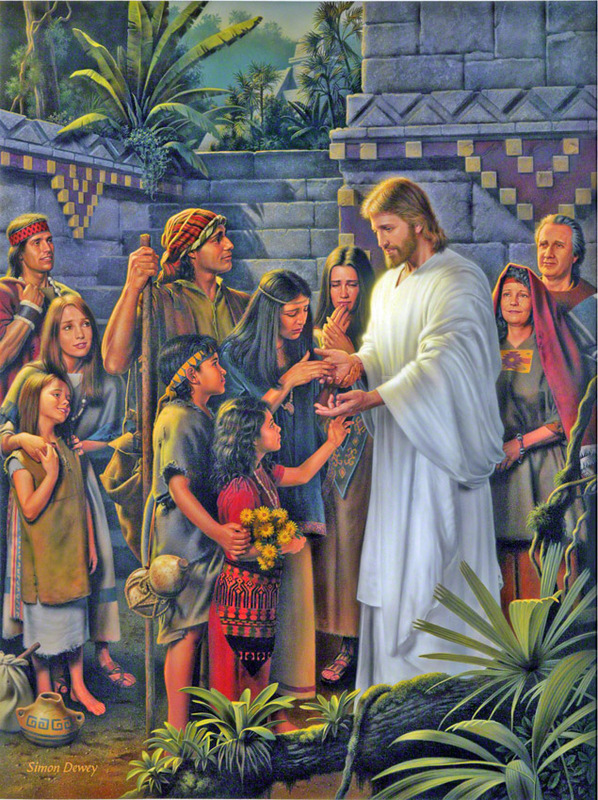 << Jesus Christ showing "the prints of the nails" his hands to a group of Nephites in the land Bountiful after his resurrection. (3 Nephi 11:14) Date 34 A.D.
A portion of one of the events when the Savior came to the Americas can be found in 3 Nephi 17:5-10 Date 34 A.D. Even though these ancient Book of Mormon people were blessed with a personal visit from Jesus Christ to them they, Both the light skinned Nephites and the dark skinned Lamanites, fell away from a correct understanding of the pure gospel and teachings of the Jesus Christ within 400 years. << Spanish conquistadors and their native Tlaxcalan allies entering the Aztec capital city of Tenochtitlan. << In the early 1500’s, the Spanish conquistadors, explorers and representatives of the Catholic Church came into the Aztec, Maya, and Inca civilizations of the New World. They indeed discovered a ‘fallen people’. 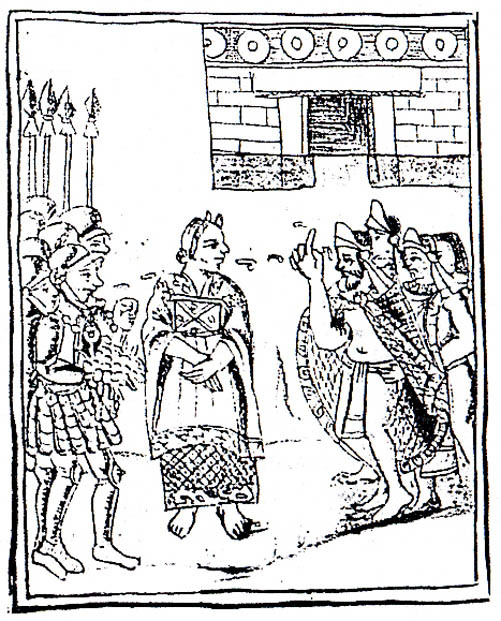 << Cortez meets Montazoma, 1550 A.D. Aztec drawing. "O our Lord,” [Quetzalcoatl] “... you have come to sit on your throne...for sometime my heart has been looking [for your return] in the direction... from within the clouds...." "The kings who are gone said that you would come to rule...and assume your throne..."
The Aztec, Maya, and Inca people were expecting the return of a God who their ancestors once believed in. That God was Jesus Christ. If they were once a "delightsome people and had Christ for their shepherd" , (Mormon 5:17), then I would think there should be some evidence that such was the case. We in our day, understand that the symbol or icon of a cross represents a belief in Jesus Christ and his death upon the cross. << A statue of Quetzalcoatl with holes in the palms of his hands. Information about the resurrected Jesus Christ's visit to the Western Hemisphere still remained among the native people in 1492 A.D. The Aztecs called this God who visited their ancestors Quetzalcoatl. The Savior also showed his hands to a group of Nephites in the Western Hemisphere. << Hieroglyph, from the ancient city of Yaxchilán, Mexico. Dated 350-850 A.D. In the pre-Columbus Western Hemisphere, the coming of the resurrected Jesus Christ to the Nephites was paramount. There are many pre-Columbus icon artifacts that have been found in Mesoamerica representing the resurrected Savior's hands carved in stone. The different statutes, icons, symbols and hieroglyphs convey a knowledge of the Savior's hands with the prints of the nails in Jesus Christ's hands. These carvings give incredible archaeological evidence and testify to the world that the resurrected Jesus Christ did come to the Western Hemisphere in 34 A.D. as recorded in the Book of Mormon. 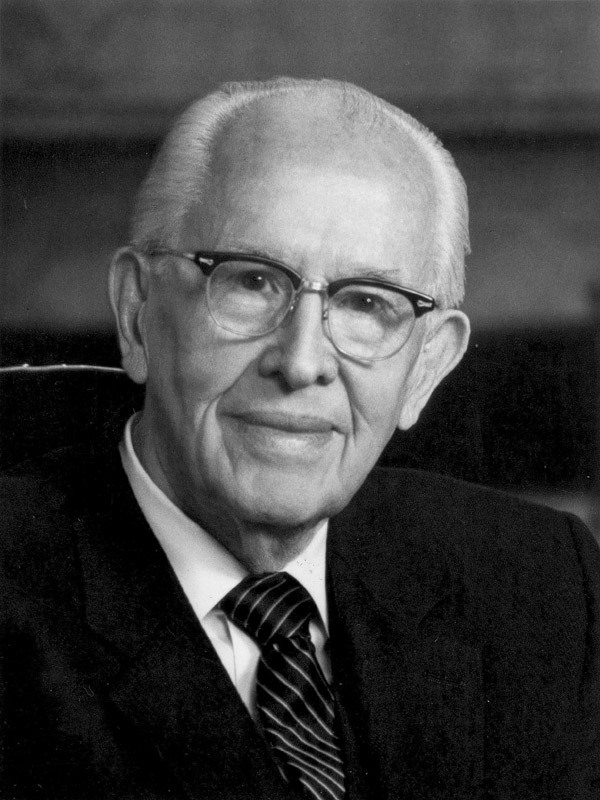 << President Ezra Taft Benson, a latter-day Prophet of God, in the Church of Jesus Christ of Latter-day Saints. We do not have to prove [that] the Book of Mormon is true. The book is its own proof. All we need to do is read it...! << A statement by Elder Neal A Maxwell of the Quorum of the Twelve Apostles of the Church of Jesus Christ of Latter-day Saints. "Eventually there will be a convergence of discoveries to make plain...what the prophets have been saying all along." Archaeology is, in fact, physical evidence that supports the truthfulness of historical events. No level of evidence is going to be sufficient for someone who does not exercise faith and who does not want to believe. “…behold, there are many that harden their hearts against the Holy Spirit, that it hath no place in them; wherefore, they cast many things away which are written and esteem them as things of naught.” (2 Nephi 33:2) 559 B.C. to 545 B.C. God has given us our freedom to entertain beliefs contrary to facts if we choose to do so. Facts are stubborn little things. What we do with them is our choice.